For a major OEM in Europe, Embien designed and delivered a fully customized Corporate training program on Audio Handling in Embedded systems covering Hardware Design, Linux and Android HAL in depth! I2S, PCM, HDMI, Intel HD, SPDIF, I2C, SPI etc are some of interfaces covered along with poplar Codecs and their design considerations. Highly focused on ALSA sub-system on SoC based designs, Libraries like alsa-lib, plug-ins, pulse-audio, GStreamer and Android. Linux is a very popular technology that is being used around in embedded systems for many years. It is the best example of how open source can impact the ecosystem positively. Right from the first version, Linus Torvalds has kept the focus on making it clean and open with active contributions from a large number of developer communities. Each version of Linux goes through a rigorous process of validation and features added/removed based on needs at that point of time. Though there are mailing lists and IRC channels that discuss the rationale behind the changes/evolution between each version of Linux, still a major part of it is not well documented. There are many parts of Linux that has little to virtually nil documentation that the developers working on that needs to go through the code to get a deep understanding and develop drivers/applications on top of that. Same can be said of Android, where even the design choices are not discussed in open. One such sub-system in Linux is the Audio. 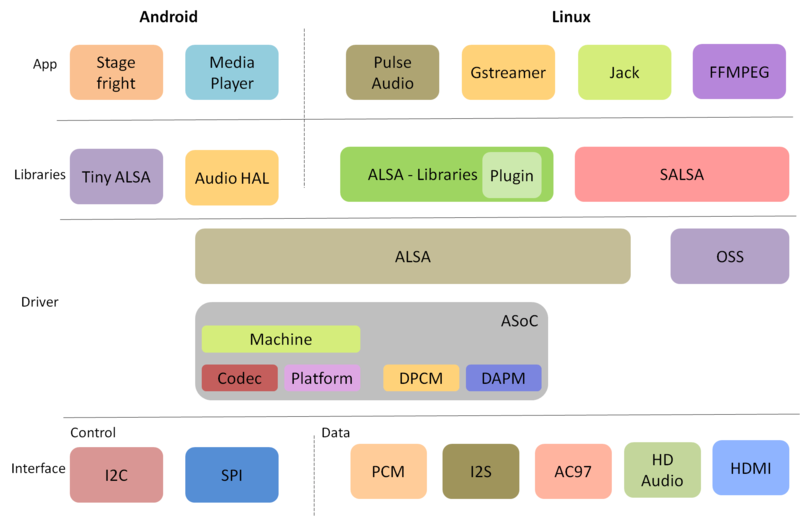 Though ALSA is the default sound system in Linux, it itself is a huge piece of work that involving a lot of layers and modules. With very little documentation available, even veteran engineers working on it needs to spend a lot of time to understand it before doing some serious work on it. The learning and development cell of one of a leading technology company based out of Europe approached us for providing training on Audio System for its engineers working on developing drivers for new codecs, controllers and applications in their ultra low power systems. Embien, a leading embedded multimedia technology focused company, successfully developed and delivered the training at the customer premises. Based on our Multimedia on Embedded Course, the customer wanted a more specialized course covering the Audio sub-system in detail. As new codecs and SoC, will be used in different iterations of their platforms, a complete flow right from the underling hardware to the top-most applications is needed. Apart of Linux, the customer wanted to understand the inner layers of Android Audio subsystem. Since the engineers will be working on battery powered embedded devices, low power consumption will be the main focus. Further the training must have hands-on experiments on their platform which is powered by a SoC that is not available in open market. Our experienced team took a specialist approach and created the training contents and materials. The overview of modules covered in the training is depicted below. Embien prepared the training and delivered it successfully at the Customer premises in Europe. Spanning three days the training, started from basic concepts to the advanced techniques in the Audio subsystem and embedded audio processing. Each day is split in to two sessions. The first session covered basic Audio concepts including the human auditory system, Controllers and Codecs, interface techniques - SLIMBus, I2C, PCM, AC97, HD Audio, McASP, USB, codec selection criteria etc. The second session covered the ALSA applications in depth enabling the application developers to work with the Audio subsystem along with ALSA Plug-Ins, UCMs (Use Case Manager), Sound servers etc. Third session on Day 2 covered ALSA driver concepts in detail. ALSA for SoC (ASoC) is explained in details - Platform, Codec, Machine Drivers, Dynamic Audio Power Management (DAPM), Dynamic PCM (DPCM)- as it is most important for an embedded developer perspective. Audio encoding process (Loss-less & Lossy) and libraries along with Speech encoding are covered in fourth session. Android Audio is covered in the third day with focus on Audio Sub system in fifth session covering Android HAL, Policies etc and Android Multimedia in sixth session detailing Stagefright, OpenMax codec integration and App development. GStreamer, SALSA, OpenSL,tinyALSA, Jack Detection, FFMEPG, Optimization and performance characterizations and many other topics were discussed. Tips and tricks for faster development and debugging are discussed in detail. Each session had a hands-on exercise covering important aspects of that session. Done on customer's platform, it enabled the engineers to understand the platform well and helped them in better audio handling in Embedded Systems. Always having a finger on the pulse of emerging technologies and trends, Embien has successfully delivered many such customized trainings for Corporate worldwide and on time for benefit of their engineers. Ready to cater different client needs, check out with the best corporate training company for your training requirements and development support as well..